High risk of a collision between rotor blades and the obstacles in a complex environment imposes restrictions on the aerial manipulators. To solve this issue, a novel system cable-Suspended Aerial Manipulator (SAM) is presented in this paper. 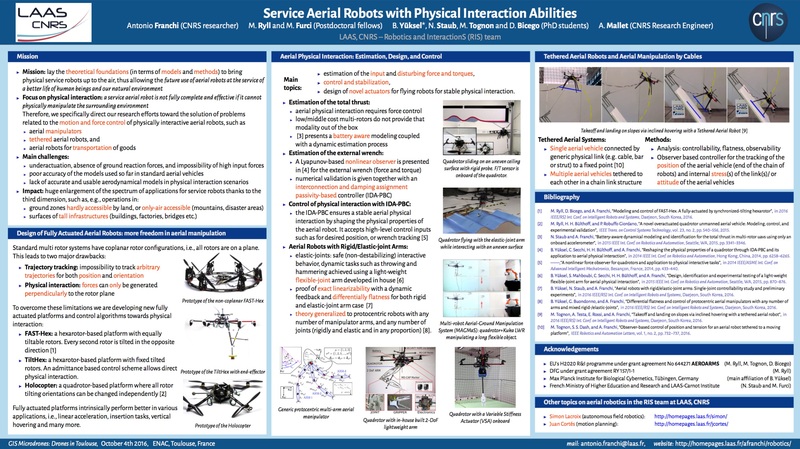 Instead of attaching a robotic manipulator directly to an aerial carrier, it is mounted on an active platform which is suspended on the carrier by means of a cable. As a result, higher safety can be achieved because the aerial carrier can keep a distance from the obstacles. For self-stabilization, the SAM is equipped with two actuation systems: winches and propulsion units. This paper presents an overview of the SAM including the concept behind, hardware realization, control strategy, and the first experimental results.